Welcome to Atlanta's Premier New Year's Eve at Taste of India brought by prestigeous Trendy Events.If you're looking for the ultimate New Year's Eve experience, then look no further! This party will absolutely rock your world as you ring in 2016 in style! 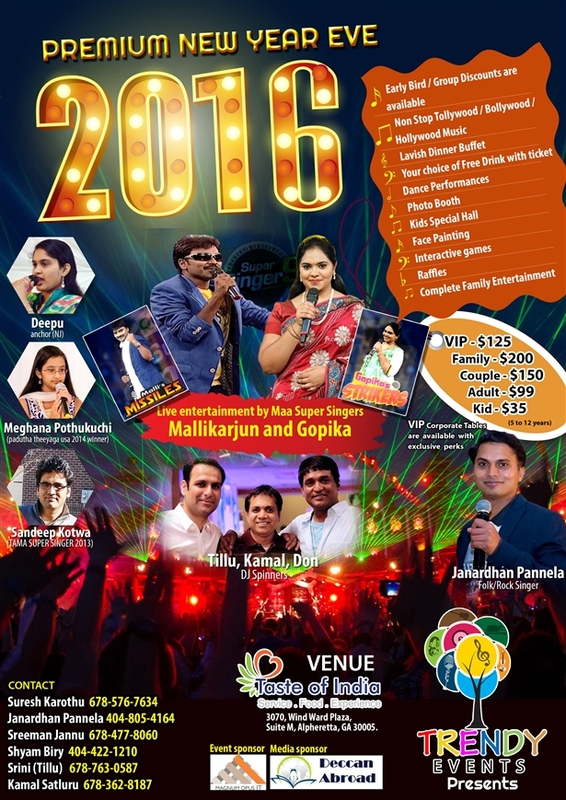 We'll party our way into 2016 by live entertainment from famous Maa TV Super Singers Mallikarjun and Gopika, Padutha Theeyaga USA 2014 winner Meghana Pothukuchi,TAMA Super singer 2013 Sandeep Kotwa and None other than Our folk/rock Singer Janardhan Pannela. You will be entertained by energetic anchor Deepu with her mesmerizing talk and interactive games. Your all inclusive ticket includes Lavish Dinner Buffet,Your choice of one Drink with ticket,Kids special area with face painting and games, Portrait Photo booth and Best Atlanta DJ Playing the perfect blend of Bollywood,Hollywood,Bhangra,Tollywood hits all the night. Elegant Banquet setting with lot of decorations.